MoCADA, the Museum of Contemporary African Diasporan Arts, is hosting a Soul of Brooklyn Block Party along Franklin this Saturday as part of the Carnival festivities. Complete information from their facebook page is below - be sure to swing by! Also, HBO's "Girls" was out filming on Franklin Avenue this evening (which means ILFA will have to start watching in order to write a rambling reply to whatever they do with our Avenue, of course) and tomorrow, Mishka the talking dog will be filming a short at the Pulp and Bean. MoCADA Museum’s Soul of Brooklyn Series this month is celebrating Caribbean Culture in the heart of the 45th Annual West Indian American Carnival Association's Labor Day Festivities where their Kiddie Carnival Parade will come marching down St. Johns Place then turn down Franklin Avenue (between 10AM- 12PM). nerships with our local cultural institutions. Special thanks goes to the Crow Hill Community Association and Franklin Avenue Merchants for their support. RSVP today to receive updates. Spend $10 or more at any business on Franklin Avenue on Saturday, September 1st 12PM – 6PM, bring your receipt to The Candy Rush (733 Franklin Avenue) and receive a FREE* scoop of ice cream or mini crepe! Shop Brooklyn! Visit members of the Franklin Avenue Merchants (FAM) – Eastern Parkway to Atlantic Avenue. Soul of Brooklyn businesses will have yellow balloons out front. Caribbean Cultural Theatre presents: Meet author Nandi Keyi-Ogunlade of The True Nanny Diaries. FREE coffee or tea with the purchase of a bakery item during the author meet and greet. 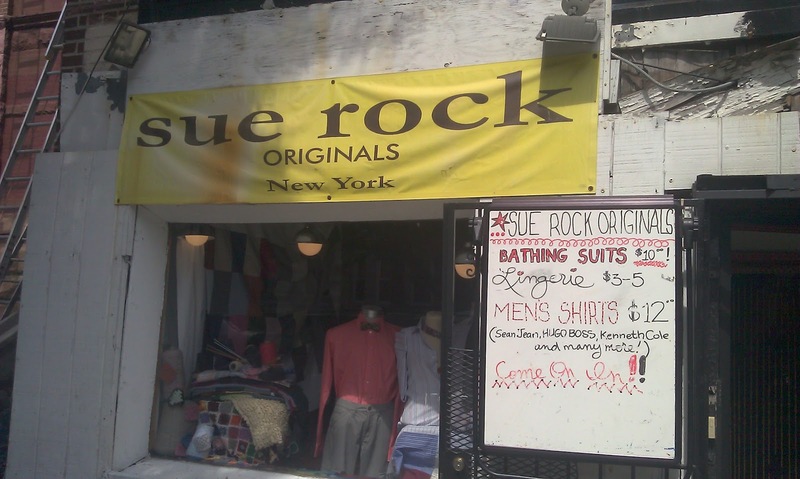 Way back in 2009, when the world and ILFA were still young, I profiled a newly-opened non-profit on Bergen between Rogers and Nostrand called Sue Rock Originals Everyone. On Saturday, invited by founder Sue Rock, I swung by to see how things are going three years on. As it happens, things are going swimmingly. Sue Rock Originals Everyone is a one-of-a-kind organization that provides support to survivors of domestic violence. Working both through their own networks and with the Center Against Domestic Violence, Ms. Rock and her team of volunteers provide training in textile arts (sewing, knitting, crocheting, weaving, etc) to survivors of domestic violence, under the rubric of "make what you left behind." Teaching skills that, as Ms. Rock put it, "we all used to know," the organization provides a new wardrobe for women who may have left their old one when they left a bad situation and the skills to make even more clothing (for personal or professional pursuits). Moreover, the process itself is therapeutic, a chance to work together in small groups to create new things for a newly turned page. While they've garnered plenty of positive press (see the video below), the organization works mostly on a donations-and-volunteer basis. 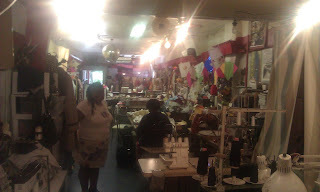 Ms. Rock, a veteran of the fashion industry, has packed her storefront space to the gills with donated fabrics, yarn, thread, and more (the contrast from three years ago, when the place looked full, was remarkable). This is a blessing in disguise, for while they'll certainly accept donations, having a strong base of consistent donations allows them to focus on programming, serving dozens of women every week. In addition to their non-profit programming, Sue Rock Originals also sells some of their own designs from their tiny display window and shop up front, including high-quality and inexpensive bathing suits, lingerie, and men's dress shirts. It's this element of their business (which is, of course, deeply connected to the non-profit side) that will be on display as a part of Brooklyn GO in two weeks. 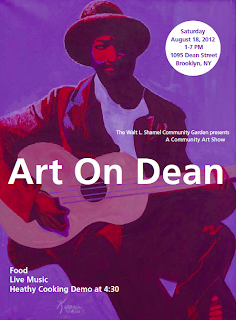 Crown Heights has many artists participating, and ILFA will be GO-filing (get it? it's a pun!) several of them in the lead-up to this great weekend of open studios from September 7-9 (artists, if you've already emailed ILFA, look for more correspondence soon, and if you haven't feel free to be in touch). Even if you're not of the gallery-hopping persuasion, you can still swing by Sue Rock Originals Everyone anytime to get involved in their fantastic work as a volunteer, or just to deck yourself out in some new duds. Check them out! SAVE THE DATE! Join us at our annual Lead By Example basketball tournament next weekend, 8/25, at St. John's Rec Center. If you'd like to play or volunteer, please call 718-773-6886. Long time no hear, but we haven't gone anywhere! Please join us this upcoming Saturday, August 25th from 11:30 - whenever. The garden is lush, the bees are happy, and the monarchs are on their way! However, there's a lot of weeding, pruning, and dead heading to do. Not to mention some painting (for much needed signs- we gotta advertise, yah know?) and a very special planting project! 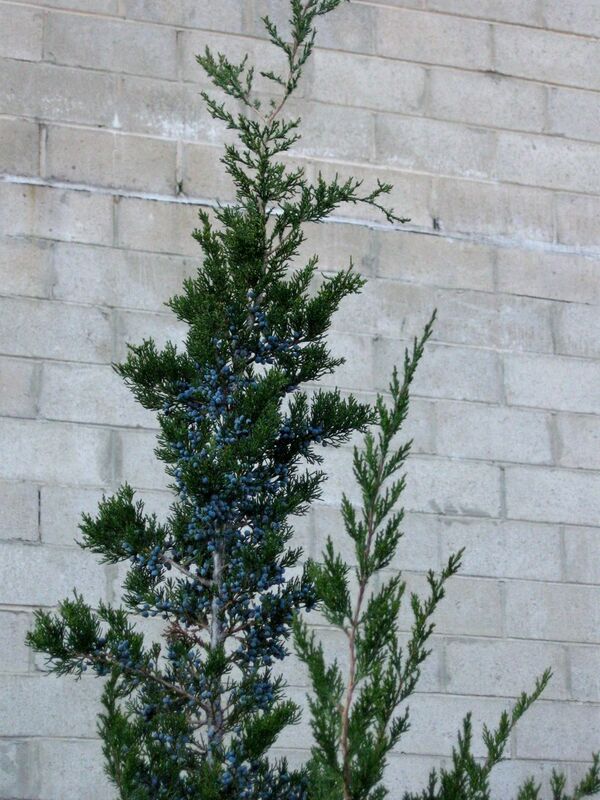 Our friends at the High Line have generously donated two small trees - a native Juniper and Lindera. Thanks, friends at the High Line. We can also harvest (although I gave all the Okra to a really nice senior citizen lady who walked by) and talk about future garden plans - cause it's your green space too! Bring pruners, bug spray, and snacks if you got em. We've got gloves, trowels, cultivators, garbage bags, shovels and more. ILFA just heard this eyewitness testimony about a violent arrest that took place about 40 minutes ago at Franklin and Union. Apparently a suspected shoplifter was running out of one of the stores and was grabbed by an officer, resulting in a short tussle that quickly turned into a rout, with the officer whaling on the suspect to subdue and detain him. This drew a crowd of onlookers, who protested what they felt was an excessive beating. When the witness I spoke with arrived on the scene, a large contingent of officers was arriving (the arresting officer or his partner likely called for backup) and dispersing the crowd, but the arresting officer was, according to the witness, "going berserk," beating the suspect even though he was in handcuffs, roughly shoving him into the squad car, continuing to beat him, and then dragging him out of the squad car to mace him in the face while other officers held the crowd at bay and did nothing to restrain the attacking officer. Onlookers protested, and were told to move along, though many held cell phone cameras aloft. One woman who persisted was threatened by the arresting officer, who the witness said looked "like a madman." This is obviously a very limited report - if anyone has any additional information or photos, please pass them along. The 2012 West Indian American Labor Day Carnival kicks off tomorrow at Borough Hall with a reception hosted by Marty Markowitz and WIADCA (the West Indian American Day Carnival Association, which hosts the Carnival). After reports of dissension among the organizers surfaced last year alongside a spate of shootings that took place over Labor Day Weekend (only two of which actually took place at the parade, but more on that in a moment), WIADCA's new president and the NYPD are making an aggressive effort to convince paradegoers and Brooklyn residents alike that this year's event will be safe and well-organized. Many Crown Heights residents, however, remain unconvinced that this year's parade will be significantly different than those in years past, as evidenced by this lively conversation on Brooklynian. Before diving into the questions of safety, power, and culture that the Brooklynians (and many others, including readers of this blog last year) have raised, it's worth reflecting on the history of the West Indian community in NYC in general and this parade in particular. Those who receive WIADCA press releases will note the email address they use pays tribute to Shirley Chisholm, a child of Caribbean immigrants who became the nation's first African-American Congresswoman and the first African-American candidate for president in a major party primary (this year marks the 40th anniversary of her run). I realize that many residents of Crown Heights could recap this history far better than I can, but for those who are relatively new to the neighborhood or unfamiliar with the history of Caribbean America (whose capital, with all due respect to Miami, is undoubtedly New York City), a few names are as good a place as any to start. Among those from the West Indies with NYC connections are legends of the Harlem Renaissance including UNIA founder and activist Marcus Garvey, poet and writer Claude McKay, and scholar-activists Cyril Briggs and Hubert Harrison (those interested in the Caribbean contribution to the Harlem Renaissance and early-20th-century black political struggles should check out Winston James' Holding Aloft the Banner of Ethiopia), civil rights leaders Kwame Ture/Stokely Carmichael and Bertram Baker (Brooklyn's first black elected politician), and many others. If we consider those with West Indian parentage, the list swells to include everyone from Malcolm X and Chisholm to Biggie and Jay-Z. Why the roll call? I think it demonstrates the degree to which Caribbean and American life and history have been (and continue to be) intertwined, an observation that makes me very wary of making any sort of blanket statements about a monolithic Caribbean "culture" (the fact that "the Caribbean" or the "West Indies" is comprised of millions of people hailing from dozens of countries speaking dozens of languages and dialects on hundreds of islands and two continents should do the trick, too) in the context of current debates about the parade. It is also serves to remind us that the West Indian community in NYC has been around a very long time, which leads to the next point - so has their parade. Begun in Harlem during the 1920s, continued uptown in the postwar era, and moved to Brooklyn in the 1960s, the parade has always been a site and symbol for conflicts and contests between New Yorkers of all stripes about the use and abuse of public space, the performance of "culture" and class (and whose culture), and debates about the boundaries of community. Caribbean celebrations of Carnival in the 1920s occasionally drew the ire of local African-Americans who felt the well-dressed and spectacularly costumed West Indians were putting on airs (though it should be noted, there was a great deal of collaboration between these two groups of recent migrants to NYC), and the parade was moved to Brooklyn in the 1960s in part due to the objections of Harlem's middle class leaders, who objected strongly to the loud music, drunken behavior, and "buffoonery" of the celebration. Despite these objections, of course, the parade has grown into one of the largest celebrations of its kind in the world, rivaled only by similar celebrations in London (where similar battles have been fought over rights to public space and the behavior of revelers over the years), Toronto, and, of course, the Caribbean (dozens of smaller events can be found wherever the Caribbean diaspora has a sizable presence). It has hosted musical legends including Mighty Sparrow and Bob Marley, and continues today to serve as an expression both of Caribbean-American cultures and as a demonstration of political power (the mayor and many electeds and hopefuls march at the head of the parade, and the floats that follow include delegations from law enforcement, unions, churches, and civic associations). Seen from this perspective, I think, it's clear that the parade, and conflict about it, aren't going anywhere. However, the specific question of safety from (gun) violence, which has been raised in years past and came back with a vengeance last year, particularly in our community after the tragic death of Denise Gay, warrants a different sort of consideration. (Lest we stumble into "culture" to explain violence, other "ethnic" parades have not been free from these incidents in years and decades past). As I wrote last year (and as many of the Brooklynians have noted), it's important not to confuse proximity with causality. This map by the New York Daily News from last year's awful spate of shootings might generate that confusion (52 shootings, 67 victims, 12 fatalities), but a closer look reveals that the worst day for fatalities was Friday (of which only one was in Brooklyn, in East New York), and the worst day for shootings was Sunday. Only two shootings took place on the parade route during the parade and neither, thankfully, was fatal. The parade itself may be loud, chaotic, and messy, but those are very different issues than murder. Many argue that the parade has the effect of drawing millions of people to Brooklyn who engage in "side parties" or "street parties" that lead to drunken acts of violence. This is true, though whether it's fair to pin the behavior of these individuals on the parade organizers is another matter. As evidenced by drunken shootouts in Queens, Staten Island, and the Bronx last year, parties take place on Labor Day with or without parades, and gun violence is a horrific reality in communities where masculinity and authority are to be found at the barrel of a gun (and gangsters and police both practice this), where entertainments beyond the street are few, where safety is not guaranteed (again, either from criminality or the police), and where mass unemployment, poor education, nonexistent health care, and mass incarceration have rendered young men's lives cheap and dignity hard to come by through "mainstream" channels (if you think that gun violence derives from race or culture instead of longstanding structural inequality, well, I'm not going to convince you otherwise here, but I'd urge you to get out and read some of the endless work on this subject). Does having the parade nearby mean that more of these parties are here in Crown Heights than might otherwise be? It does, and residents have every right to be concerned about violence. In the short run, there are steps being taken this year by WIADCA and the NYPD (see the NYDN link at the top), and the Brooklynians have some good ideas, too. In the long run, it means recognizing that gun violence is a 365-day-a-year problem in many communities (witness the terrible shooting in Crown Heights just this week), even if the parade only brings it to some of our doorsteps once a year. Seeing the parade as part of a citywide anti-violence campaign, as one resident imagined after last year's event, is a start, as is investing in the efforts of local community groups (check out SOS Crown Heights's basketball tournament this weekend, for instance). Finally, by all means, go out and see the parade on Labor Day (photos from years past here and here). The event itself is safe for 99.999% of attendees and the costumes, music, dancing, food, and atmosphere can't be found anywhere else. Will it be loud, chaotic, and messy? Of course! That's part of the fun. See you on the Parkway. Crown Heights is usually introduced in the mainstream press in ways that suggest the neighborhood has a "face for radio" (to wit: this NYT review of Bar Corvo from May), but that hasn't stopped videographers and filmmakers from turning their lenses to Franklin over the past few months. Above, you can check out "I Wanna Get Drunk," the latest music video from Brooklyn-based folk group The Tres Amigos (their accordionist is a proud resident of Franklin Avenue), in which our fair avenue features prominently, and those around the area this weekend might have noticed filming for Mission Dawn, a new series in production for Nickelodeon. If watching movies if more of your thing than making movies, never fear: along with regular movie nights at the Candy Rush, 739 Franklin, and the Walt L. Shamel Community Garden this summer, Filmwax has a new screening series at Franklin Park. Tonight's film, Redlegs, starts at 8pm sharp (seating at 7:30) with $4 pints on offer and director Brandon Harris on hand. Two great events this weekend, both on Saturday. Click on the flyer above for more info about Art on Dean, and click here for more info on Wash Ave Rocks. Two and a half years after the Bedford-Atlantic Armory was last in the news (when our local elected promised $11 million out of what they deemed a necessary $20 million to revamp the drill hall as a youth and community space), the city's Economic Development Corporation has issued a request for proposals regarding the space. The complete RFP is below - readers, what do you want to see in this space (and if you're going to do something to make your vision a reality, let us know)? New York City Economic Development Corporation (“NYCEDC”), on behalf of the City of New York (the “City”) and the Department of Homeless Services (“DHS”) is seeking proposals (“Proposals”, each a “Proposal”) from qualified developers for the ground lease, development, and operation of approximately 50,000 square feet of available space within the historic 23rd Regiment (also known as “Bedford-Atlantic”) Armory (“Armory”). 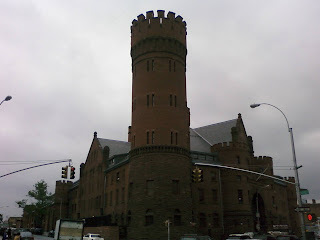 The Armory is located at 1322 Bedford Avenue in Crown Heights, Brooklyn. Through this request for proposals (“RFP”) NYCEDC is seeking users or developers who (i) enhance the surrounding community’s access to the Drill Hall through potential neighborhood-serving uses, (ii) cause minimal impact to DHS’s active operation within the Armory Head House, (iii) ensure that future Drill Hall uses are community-serving, iv) create a financially feasible and economically viable project, (v) complete necessary capital improvements, and (vi) contemplate and preserve the historic character of the facility. NYCEDC plans to select a qualified developer or user on the basis of factors stated in the RFP which include, but are not limited to: economic impact on New York City, experience of key staff identified in the proposal, the proposed project’s financial feasibility, demonstrated successful experience in performing services similar to those encompassed in the RFP, and the proposed lease terms. Literati, rejoice! Today, the Renegade Reading Series celebrates its First Anniversary with a BBQ at LaunchPad from 4-9pm, while tomorrow, the one that started them all, the Franklin Park Reading Series, returns to Franklin Park with a star-studded lineup at 8pm. ILFA was totally AWOL this week, on account of some traveling and some grad student work. Sadly, this meant I missed posting about the Seeds in the Middle Crown Heights Farmers Market on Thursday, the return of Sound Baths at Force and Flow on Friday, a campaign kickoff at 739 Franklin on Wednesday, and in all likelihood, an edition of the Filmwax Film Series or Brooklyn Unplugged at Franklin Park, a sing-along at Little Zelda's, and a Secondary Sound Jam Night at Breukelen Coffee House. The truth is, there's far too much going on in Crown Heights these days for one blogger to try and cover, even when said blogger is not asleep at the wheel. 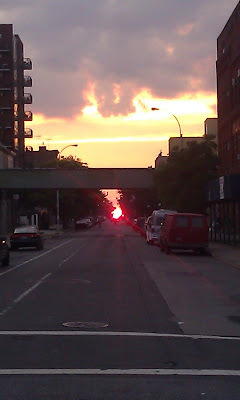 Thankfully, there's still the Brooklynian Message Board, Prospect Heights Patch (who do a fair bit of Crown Heights coverage), Sonja Sharp at DNAInfo, and now, a new blog by a local resident, I Should Take You There. That said, there's still some fun stuff going on this weekend! Today, check out the Farmers Market at the Walt L. Shamel Community Garden (Dean btw Franklin and Bedford) from 8am-2pm, and then swing over to the Owl & Thistle General Store for their 1st Anniversary (full details below). We want to show our customers some love and gratitude for a great year. Receive 10% off all purchases over $25 on 8/12! 11-1 pm Kids Coloring Contest - Participates will get a special Crazy Crayon to take home! On Sunday, a new show of photos and video, Altered Landscapes, opens at Five Myles Gallery from 5-8pm. Finally, on Monday, the Franklin Park Reading Series, recently dubbed the best in the city, returns for August with a great lineup. Also, if you're looking for work in the non-profit/social justice sector, SOS Crown Heights and the Crown Heights Community Mediation Center are hiring. - That said, there are still plenty of reasons to swing by The Candy Rush, where, in addition to ice cream, you can bring your little ones for summer classes. They've just added music and French classes, every Thursday at 11am (swing by for more info). Weekend Roundup: Built in Brooklyn, Five Myles, Calabar, and Proust! - The latest edition of the Built in Brooklyn Craft Fair runs 12-6pm at LaunchPad. - Five Myles Gallery is showing Veit Stratmann's video work "A Hill" from Friday-Sunday. - Calabar Imports, formerly of Washington, has reo-opened at 708 Franklin. Swing by and check 'em out. My name is Michael de Zayas, and I want to read In Search of Lost Time. I want to read it from the first sentence to the last word. And I want to start now. Maybe you have wanted to for a long time, too. Or, maybe you'd like to re-read it. And yet: Where do we find time for Lost Time? How do I not wander off track amid the ways of 4,211 slow-reading pages? Welcome to the Franklin Avenue Proust Society! We will be meeting every Sunday night for the next two years. By collectively sharing week by week the joys of small, incremental readings, we live the novel together, slowly. Our first meeting is this Sunday night, Aug 5, 8-9 p.m.
We will meet every Sunday night from 8 to 9 at Little Zelda, which will be closed to the public especially for our gatherings. We will read 40 pages a week. (40 pages x 104 weeks/2 years = the whole book.) A manageable weekly amount, and yet a challenging amount. I imagine our get-togethers more or less along the lines of this: a dozen of us will be there this Sunday night. This is a quiet group. We will talk. We will share our favorite parts of the week's reading. We will have a general talk about what's going on in the plot, review the characters, and share countless instances of beauty. There will be also occasional special events. Specialists will talk on occasion about other things going on during Proust's era; other authors that mattered to Proust, painters who played a role. I myself have a great book called Paintings in Proust with images from all the paintings mentioned in the book. I have a postgraduate friend who wants to read one night a book of Baudelaire's prose poems, "Paris Spleen," that he finds integral to Search for Lost Time. Sharing along those lines. This Sunday will be a gentle introduction. Purchase and bring Volume I, Swann's Way and read 10 pages of it. There are many translations -- the standard bearer is the Modern Library edition. It's excellent. (there will be plenty of time, and many more volumes to switch to a different translation; it and it does not matter if everyone has a different translation). I vaguely recall a passage where Proust says something like: if only we read the great books as frequently as we read the day's newspaper; and the newspaper as infrequently as the great books. This is last minute, but SOS Crown Heights will be hosting a shooting response tonight to respond to TWO shootings in Crown Heights over the past few days. If you can spare the time, consider attending - these events are crucial to ensuring that no gun violence goes unnoticed, and to keeping any of us from growing accustomed to it.